Dubai, UAE, June 25, 2018: Haute couture marries structure and embellishment to live happily ever after. This union is at the heart of the Balmain Flamea II. Classical shapes, intricate patterns and harmonious attachments join together to create watches fit to grace the best of look-books. Swiss made reliability is the faithful friend of designs that promise to add a magical touch to the diverse style statements of the contemporary female. These timepieces are made-to-measure for engagements ranging from early-morning commutes to mellow sundowners. Inspirations spanning from the elaborate metalwork of the Eiffel Tower, to the lace of a nostalgic evening gown, are the framework of this family. Right angles and loops speak the same language when it comes to decorating eye-catching mother-of-pearl dials with puzzle-like precision. This embroidery-like signature is echoed by fine metal bracelets and stitched leather straps with either a patent or cushioned finish. 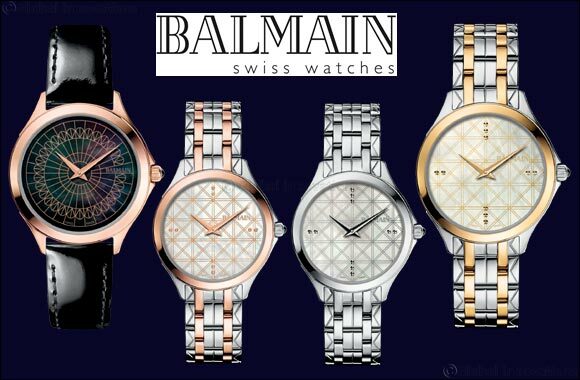 This Balmain collection watch are available at all Rivoli stores and Hour Choice across the UAE.